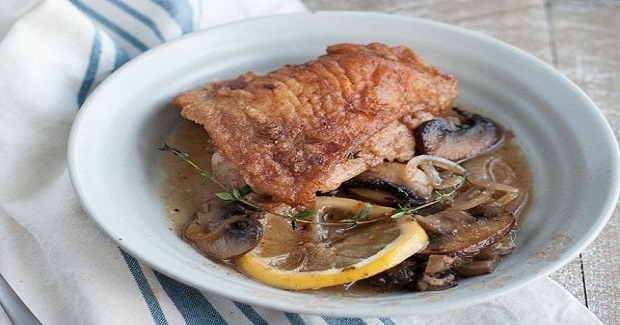 Skillet Chicken With Mushrooms,Shallots And Wine Recipe - Gutom Na! Posted on Monday, June 27th, 2016 at 4:43 pm. In a medium bowl, mix the flour, salt and pepper. Dredge each piece of chicken in the flour mixture. Heat a large cast iron skillet over medium-high heat. Heat the oil in the skillet and add the chicken, skin side down. Pan-fry the chicken 5 to 7 minutes turning once, until golden brown (but not cooked through). Remove the chicken from the pan and set aside on plate. In the same skillet, add the mushrooms and shallots. Cook over medium heat for 4 to 6 minutes, until softened and golden brown. Add the garlic, wine, chicken stock and lemon juice slowly, stirring to get all the browned bits from the bottom of the pan. Cook over medium heat until reduced by half, about 5 minutes. Add the chicken, lemon slices and fresh thyme sprigs to the pan. Transfer to the oven and bake 18 to 20 minutes or until the chicken reaches 165°F, spooning pan sauce over the chicken every 5 minutes. Serve over rice or with toasted french bread and a side salad.